Romney's campaign is using the same ad targeting tactics as airlines and shoe stores. on the music site Grooveshark, and up popped two ads for Mitt Romney's presidential campaign. One invited me to "Learn More." The other suggested that I "Donate." Had Romney's campaign decided that swing voters might frequent an Internet music site with copyright issues? Are Glee fans now a key demographic? But it turns out the campaign wasn't advertising to Grooveshark listeners or a capella fans. As a reporter covering how campaigns use voter data, I spend a fair amount of time on Romney's official website. That apparently triggered an online targeting company to send me Romney ads wherever they could find me on the web. "If you visit our site, you are likely to see our ads," a Romney campaign official told me, when I forwarded a screenshot of the ads. This is the same kind of online targeting used by sites that sell airline tickets or shoes. If you visit Zappos, advertisements for the sneakers you looked at will sometimes follow you around the web. Romney's campaign was sending me a "donate" button instead. But the fact that I was being targeted based on my visits to the campaign site wasn't at all clear from the ads themselves. Each of the ads had a teensy blue triangle in the top right corner. Because I report on online advertising, I know that the triangle means I've been targeted. Many online ad companies have agreed to give consumers a heads-up that they're seeing a message that's been personalized to them. They mark targeted ads with a blue triangle icon or the words "Ad Choices." When I clicked on the blue triangle on one of the Romney ads, a message popped up saying that a company called ShareThis had "determined that you might be interested in an ad like this." The ad had been "selected for you based on your browsing activity." To find out exactly what information about my "browsing habits" was being used — and how it had been collected — I had to go behind the scenes, into the complicated world of online data tracking and targeting. I was only vaguely aware of ShareThis, and hadn't realized it had anything to do with advertising. The company is probably most widely known for the little sharing buttons on many sites that make it easy to post stories onto Twitter and Facebook. You can find ShareThis widgets across the web, from the Los Angeles Times, The Boston Globe, New York magazine, and The Huffington Post, to the Food Network, and Us Weekly. Barry Grant, an executive in charge of privacy at ShareThis, told me that the company actually gives its widgets away for free, and also includes statistics that tell publishers what's being shared, and where. What it gets in exchange is information about what individual surfers are reading and sharing across the Internet — a valuable trove of data that it uses to target online ads. The company works with nearly 1.4 million different websites, all of which have agreed to let ShareThis collect information about their visitors. When an advertiser comes and tells ShareThis that they want to show an ad to people who are interested in Republican primary elections, ShareThis can identify a group of people who have recently read articles or watched videos about the primaries, and show them ads. This means that ShareThis has the ability to help the Romney campaign identify groups of voters interested in particular issues — and because Romney's campaign website uses ShareThis buttons, the company is also collecting information about visitors to the campaign's own site. Even before a campaign official confirmed that they did target ads at users who visited the campaign site, ShareThis's Grant said that he was "100 percent certain" that my visiting the site "was a major factor." While a Romney campaign official confirmed that the campaign targets ads at users who visited the campaign site, the official — who declined to be named — wouldn't go into detail how the targeting was done. Grant said ShareThis could have also worked with the Romney campaign to target users interested in a variety of topics, from broad categories, like people who visit pages about "Republicans," to more narrow ones, like people interested in "No more taxes." He pointed out that some advertisers also choose to target people who are interested in their competitors. "Let's say Nissan wanted to go after people sharing content on Hondas. We could find people who looked at, shared, clicked on topics" related to Hondas, Grant said. So Romney's campaign could also use ShareThis to target people who were reading or sharing content about Obama, or about Obama and certain subjects, like healthcare or the economy. 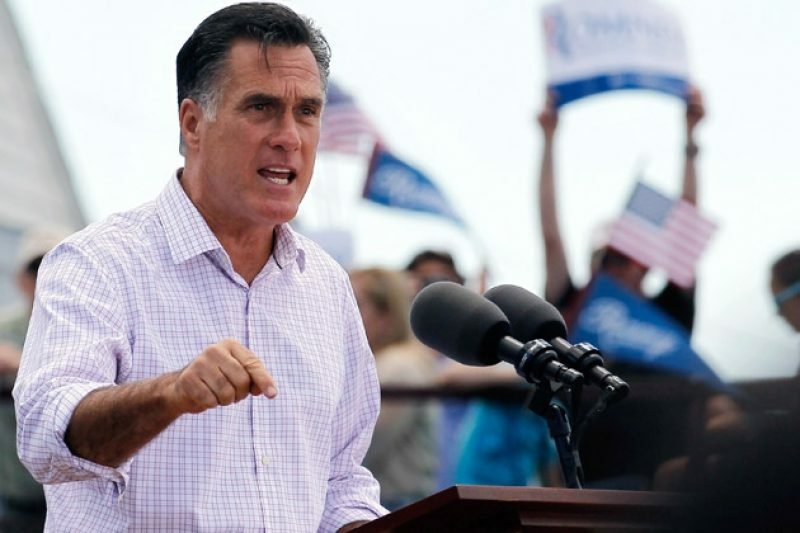 "It would be smart for him to do," Grant said, especially if the Romney campaign was trying to reach undecided voters. ShareThis is careful to stay away from some tracking. It doesn't gather the information users type into web forms, even though that's a capability other tracking companies have. The company also chooses not to match its data on users' browsing habits with their real-names or offline sources like voter records. They also won't connect your real name to your online interests, even if you log in to ShareThis via Twitter or Facebook. Earlier this month, I wrote about how Microsoft and Yahoo use registration data (like names and Zip codes) to match Internet users to their official voting records, so political campaigns can target ads to particular people based on their party registration or donation history. Grant called that "a slippery slope," and said that ShareThis preferred to keep its data on individual people completely anonymous. "Even if it is matching data that is one step lower than anonymous, to me, it's not a safe place to be operating," he said. All this information was helpful — but it still didn't answer one lingering question. Was the song that I had searched for on Grooveshark, Pink's "Raise Your Glass," part of the targeting process? This isn't a farfetched question, since the Romney campaign told the New York Times in April that Internet users' musical taste actually played a role in the campaign's microtargeting research. Among other factors, people who like jazz were unlikely to respond to Romney ads, the campaign discovered. But ShareThis spokeswoman Jennifer Hyman said that the company did not target its ads "based on the music the user is listening to." So it's still unclear whose political ads you'll see if you're too school for cool. If you spot that blue triangle on an online political ad — for Romney, Obama, or any local candidate — let us know. The words "Ad Choices" at the corner of an ad are another sign that the ad has been targeted. We'll be able to learn the most about how you were targeted if you take a screenshot of the advertisement, and another screenshot of the accompanying disclosure message, and send them to us via email at [email protected]. Please include the full URL of the page where you saw the ad. Not sure how to take a screenshot? Here are the instructions if you're using a PC, using a Mac, or using a smartphone. You can also check out our "Message Machine" project, which is analyzing how campaigns are targeting voters with different versions of campaign e-mail messages.